We understand supplying artwork can be a bit of a minefield so we try to keeps things as simple as possible. We will create the artwork for your labels and tapes manufactured by us. When we generate your artwork we will give it a unique Design Reference (DR) number that will be specific to this individual product only. Our DR’s are essentially a part code allocated to this specific TAMPERTECH product for you. We send PNG proofs of the DR via email and require approval prior to the job being passed for print. It is the customer’s responsibility to check that the proofs are correct for layout and content. No spelling or grammar check will be undertaken by us, as the fonts will have been outlined prior to upload and therefore can’t be edited. Colour may vary on monitors and therefore the proof cannot be used to guarantee colour. We print in CMYK, so we aim to match colours supplied as closely as possible to your pantone. Artwork not supplied to our requirements will likely render an unsatisfactory result and delay your order. If you’re unsure about the artwork you have, please check with us beforehand to ensure there are no complications. Any barcodes you want on the product are recommended to be placed on a white background to ensure success when scanning it, especially for smaller barcodes. Non Residue, Peelable Adhesive – this is useful when you do not want any residue to be left on the application surface. Flexibility and versatility is vital to the success of tamper evident labels and tapes, therefore, Tampertech offers a wide range of technologies within manufacture to create individual, intelligent tamper evident labels and tapes to achieve the optimum security solution for you. Does the label/tape need to be permanant or non residue? Would you like to include your logo? Would you like a barcode included? 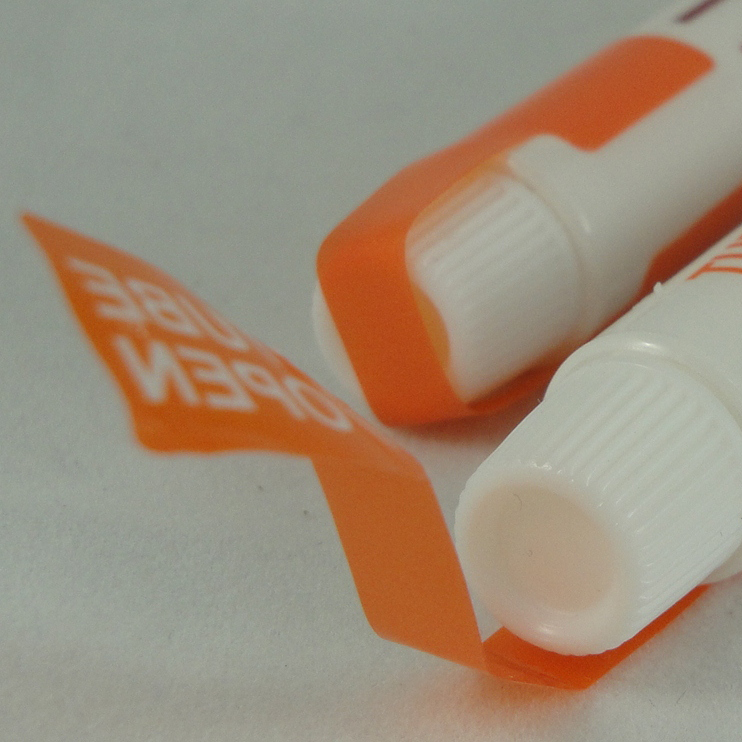 Permanent, full transfer tamper evident labels or tapes delaminates completely on the surface of application and leaves a permanent mark behind. An Overt tape or label is where the tape or label has an obvious SECURITY message on the surface and may also have sequential numbers too, providing additional security through tracing the parcel. Overt tapes and labels deliver a clear, highly visible security message that it is a security tape. Deterring opportunistic pilfering and product tampering. What are the surface conditions like? What is the product application? What environment will the label/tape be exposed to? Does the label/tape need to be permanent or non-residue? Do you have a sample of an existing label/tape? Would you like a void message? Is the label/tape machine or hand applied? Would you like the label to have a barcode? Would you like the label to have a quick response code (QR CODE) ? Non residue tapes and labels do not leave any VOID/OPEN message on the surface or adhesive residue. Used on aircraft doors, hatches, cupboards, gas pumps, draws and much more. A tamper evident label that looks like a plain tape or label until its is removed, where it then reveals the security message VOID OPENED, SECURITY STOP has no obvious signs that the tape is tamper evident minimizes attention to a package during shipping. Tamper evident products; tapes and labels are only as effective as the surface they are applied to. The surface condition must be considered: roughness, smoothness, porosity, coated, uncoated, cleanliness, flexibility, temperature conditions, wet or dry, and finally the energy of the surface. All surfaces have energy associated with them, because work is needed to form them. These are the forces that are required to hold the molecules together to form the surface, whether it is a desktop or a cardboard box. Surfaces are referred to a low energy or high energy. These surfaces are hydrophobic, which means they hate water. If the water droplet has a high angle from the surface it demonstrates that the surface doesn’t like water and is therefore hydrophobic. Low energy surfaces are typically acrylic, plastics, rubber and composites. These surfaces are harder for labels and tapes to stick to. These surfaces are hydrophilic which means the surface likes water. If the water droplet has a low angle from the surface it demonstrates that the surface likes water and is therefore hydrophilic. High energy surfaces are typically glass, cabinets and car paint. can seal an area, pallet, package or product after authorised checking has made secure – saving time and money!